I have relationships with lots of people. I have relationships with my parents and sisters. I have relationships with my friends and colleagues. I have a relationship with my girlfriend. I even have a relationship with the cashier at the Trader Joe’s who doesn’t make me feel bad when all I buy is chips, beer and chocolate peanut butter cups. But do I have a relationship with God? Could I have a relationship with God that bears a psychologically meaningful resemblance to my relationships with the important people in my life? Setting aside my own atheistic tendencies, that question stated more broadly is the one that intrigued me, along with my collaborators Karina Schumann and John Holmes: Can people have a relationship with God that approximates in some psychologically meaningful way their relationships with other people? Existing literature had already begun to approach this question. Lee Kirkpatrick, Pehr Granqvist, and their colleagues have likened God’s role in people’s lives to that of a parent in the lives of children. Others have noted that people spontaneously describe their connections with God using the language of interpersonal relationships, and that God provides psychological benefits similar to those that relationship partners provide (for example, enhanced wellbeing). Building on these findings, we wanted to see whether we could go further and map the psychological processes that underlie interpersonal relationships onto people’s connections with God. 2. We should see this effect particularly among people with high self-esteem, because only these individuals trust that others will see them as valuable relationship partners. The alternative possibility – that self-esteem will be irrelevant to this process – struck us as also quite plausible: It might well be that even people who doubt their self-worth can have faith that God loves them. We tested these ideas across four studies. In the first three, we threatened people’s romantic relationships, and asked them about how close they felt to God. We didn’t literally threaten their relationships – say, by finding their partners and introducing them to tempting others – rather, we used a manipulation developed by Sandra Murray and her colleagues. We asked people to tell us about various aspects of themselves that they hid from their relationship partners – presumably aspects that might make their relationship partners re-evaluate the relationship. Just to really hammer it home, we also told them that these “secret selves” almost always come out in the long run, and end up ruining the relationship. We then assessed their felt closeness with God, using self-reports taken directly from the interpersonal relationships literature. We also assessed downstream consequences of closeness, also taken from the interpersonal relationships literature. For example, we measured people’s tendency to respond constructively, rather than destructively, to perceived transgressions – we also had them imagine that God wasn’t there for them in a time of need, and tell us how likely they would be to do things like talk to or forgive God, and things like get angry or stop believing in God. To address an obvious question, before I describe our findings I should note that they apply primarily to people who have some degree of religious belief. As far as we could tell, however, they seem to apply equally well to people raised in a Judeo-Christian faith as they do to people raised in a Hindu culture. These caveats aside, we consistently found that, compared to neutral control participants, participants who had just told us about the “secret selves” they hid from their partners reported feeling closer to God (and as a result, behaving more constructively in their relationship with God), particularly if they had high self-esteem. In our final study, we tested the reverse possibility. We threatened people’s relationship with God using the exact same manipulation: We asked people to tell us about aspects of themselves they try to keep hidden from God. This might seem a little strange, given that we often think of God as an omniscient being who knows everything. Even so, compared to neutral control participants, participants who told us about aspects of themselves they try to hide from God reported feeling closer to their romantic partners. 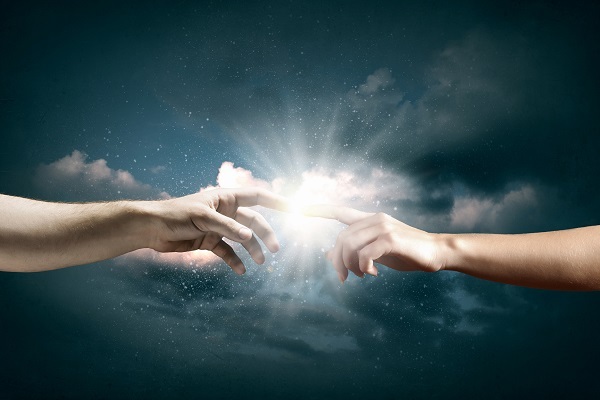 These studies, we think, provide the first evidence that people’s sense of connection with the divine and their sense of interpersonal connection fluctuate as part of a dynamic system. In so doing, our findings help demonstrate important psychological similarities between people’s so-called “relationships” with God and their relationships with other people. So by all means, go talk to that new hottie who just joined your church / synagogue / temple: The chances he or she is single just got a little better. Kristin Laurin is an Assistant Professor at the Stanford Graduate School of Business. She studies how religions and political ideologies intersect with goals and motivations. You can reach here at klaurin@stanford.edu, and read more about her here.